While I did do some shopping, there is no haul video this month. One of my purchases hasn't arrived and so I'll wait until then to film a video. Instead, I'll share with you the two pieces that I do have after buying them this month. Jeanswest had a 30% off sale on knitwear, so as I usually do, I checked the site 'just to browse' and saw this beautiful waterfall drape cardigan. I ended up buying two! The cardigan comes in three colours, so I went to the store to try them on, and ended up loving both colours I tried on and bought both. After donating 3 of the cardigans I'd just unboxed from my boxes of winter clothes I pulled out of storage though I felt justified in doing so! As you can see from the photos below of how I wore the cardigans, you can wear them two ways which instantly appealed to me. There are two buttons, one on each shoulder of the cardigan, and a button hole at the bottom of each hem. That means you can button up one or both sides of the cardigan when you wear it (like I did here). It's ideal for breastfeeding, as it turns your cardigan into a breastfeeding cover, and is something I wish I had when I was breastfeeding. I used to have to hold baby and the cardigan over the top of him when using my cardigans as breastfeeding covers. While my breastfeeding days are behind me, I'm still tagging breastfeeding friendly outfits on the blog. I'll just be making use of the feature when I want to wear these cardigans differently! When I buy things, I think of two ways to wear them. With the buttons making these cardigans adaptable, it was an easy purchase to make as I have so many more ways to wear them. I'm thinking that the new thicker red cardigan will get worn more than the light one it replaced too. I'm pleased I was able to wear these cardigans so soon after I bought them, unlike the last knit I bought back at the start of autumn when it took weeks for the weather to cool. Special mention also to these two lovely kimonos the boys got me for Mother's Day that were added to my wardrobe in May! For the third thing I bought, I will share a reveal video as soon as it arrives. I ordered something from the Rebecca Minkoff online sample sale. There will be a delay in shipping as the sale was so popular, and it takes a while to reach Australia from the US too. Can't wait for it to arrive. Make sure you're subscribed to my YouTube channel to see it before it reaches the blog! Linking up with Style On The Daily, Oh Hey Girl, Fashion Frenzy, Fashion Files, Fun Fashion, Weekend Wear, Fabulous Friday. You picked them so right, Mica! The colours are beautiful. Blue and red are two of my favourite colours. You are always creative with how you wear your pieces. Lovely. haha yes I am sure I will get so much wear from them both, so had to get them both! I'm so lucky that they got me the kimonos. Dear Mica, now wonder you bought even two colours of this beautiful cardigan! I see the pieces are very versatile. I own some similar cardigans and wear them often - therefore I know about what I'm writing :) Love also the kimonos. You are a good purchaser! 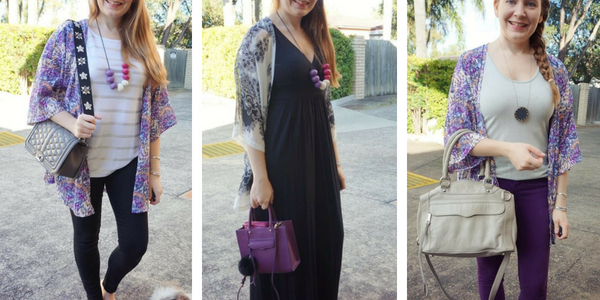 The cardigans look perfect for any outfit and kimonos are so easy to wear - great items! Your boys did amazingly well on their kimono selections for you! Both of those are so pretty. And the new cardigans you chose are such fun bright colors. Can't wait to see your new bag! Yes they picked such nice pieces! I'm glad my new bag has finally arrived, ha! You bought some amazing pieces in May! You look so pretty! Loving the bright colors! I always think I do a good job of showcasing versatility with items, but you really are the best at it, Mica!! Thanks Jodie! I like thinking up new ways to wear things! I'm so glad you find it inspiring! Yes, they did a great job picking them! I think they will work nicely for winter here, might be a bit warm for our summer. I am a huge fan of waterfall cardigans, they are so elegant! I do like both the red and the blue cardigan you bought. These two colours are so pretty. So great they are good for breastfeeding and it would have been perfect if you found them sooner, but it is never too late to buy something chic and practical. The two kimonos boys got for you are so amazing... and they look great on you. I don't have enough kimonos. Great purchases & gifts this May. I can't wait to see what else you have ordered. I bought a few things this May after not buying anything for months. Thanks Ivana! It's true, I might not use them for breastfeeding but I am glad to have them! :) And I think I can never have too many kimonos, haha! You have chosen some amazing pieces. You did an amazing job styling them and I love how they goes with everything! I pray you are having a great week. A lot rain here but grateful for it. So going to have to check out your breastfeeding outfits. Since I'm currently have been breastfeeding for almost 8 months. Also those cardigan look so cozy. Oh and "those boys" really know your taste, they chose those kimonos well. they did a very good job! Even if the little one changed his mind a few times, ha! They picked great ones in the end. My favorite thing about the top cardigan is the way it wraps up, how cozy and cute! As always I love your kimonos too! Yes it's such a fun feature for the cardigans to have! That last kimono is beautiful! I love the purple shades and cannot wait to see this new bag of yours! I'm also crazy about cardigans, love these colours that you chose! I'm really liking the long drapey look of these (remember when we first started blogging and waterfall cardigans were a big new thing?? ), and I love both colours. I like that button option, although I don't think I would use it. The new cardigans are fun! I wear a lot of long, drapey cardigans throughout the year (I have both lighter ones and heavier/warmer ones). Your new Mother's Day gift kimonos are also really lovely. I'm hoping I get a lot of wear from these ones! Ooooh! I love your cardigans! I want them both, too. :) You'll get so much use out of them! Your kimonos are beautiful as well! Aww I love the kimonos that your boys got you for Mother's Day! And those cardigans are great--I think it's smart to buy something that you love in multiple colors. There are times when I've found a piece like that and wished that I had done so. I can't wait to see the 3rd item! I'm glad the third piece has arrived at last, haha! They're cute picks dear, especialy the floral kimono. Looks so adorable on you! You look great in all the looks :) Great! Thanks for sharing <3 Lots of love! haha yes, I'm looking forward to wearing them more often as it's winter here! Mica I love it! I love waterfall cardigans like that! I recently bought two from H&M in black and blush pink! They would be such wearable colours! All of them are excellent pieces to add some interesting layers to any outfit. I love how comfortable long cardis are, and the red one is just gorgeous! The two kimonos you got for Mother's Day are beautiful too, the prints are so subtle yet they give the right amount of color and texture, I love them. They are such nice kimonos, the boys picked well. Those kimonos and cardis are so cute! I love how you styled all of these looks! I just love those cardis, they drape over you so nicely! Cardigans have really up'ed their game over the years, so many fun ones out there now. I also love you in purple and you seriously have a lot of cute cardis! The three quarter waterfall silhouette looks really chic and versatile. You will surely get so much use out of both cardigans. Your boys made such lovely choices with those kimonos :D They look great! The cardigans you got are so fun! I love both ways they can be worn! What a great item! I am in love with the pretty purple kimono you received for Mother's Day too. What a gorgeous print! 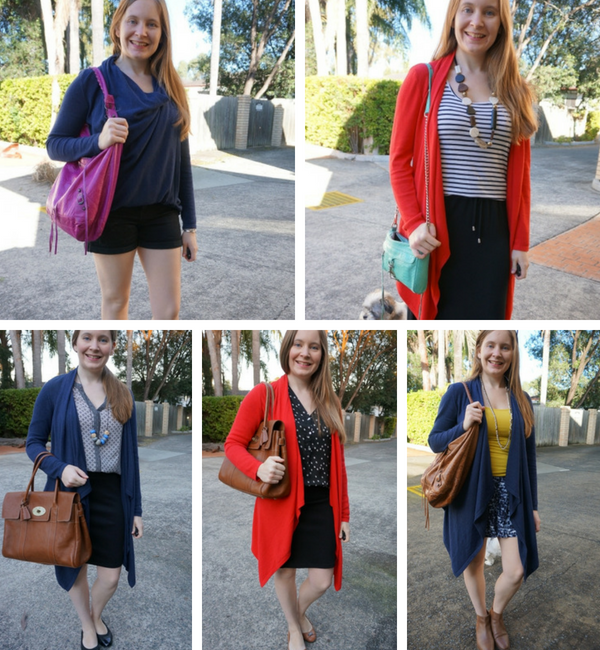 I am such a fan of cardigans especial for a lot of things and very usefuls I really love your post! All great pieces,so many different styles and outfits you can wear them all with. Kimonos are always a great addition to any outfit! You always do a great job wearing and remixing all the pieces in your closet Mica. Such great cool but not cold weather looks. Love that printed lavender kimono, too.